Newcastle Kart Club held the second round of the Australian Kart Championship over the weekend with wild weather starting the weekend. Former National Champion Jac Preston was looking to continue his strong start to the championship in Ipswich. Preston after finishing top five in round one was looking to gain more valuable points to his championship. Qualifying was meant to get underway on Saturday morning but due to heavy rain part of the track was under water and there was a two-hour delay in proceedings getting underway. Due to the long delay qualifying was cancelled and the opening heat starting positions were gathered by the final timed practice on Friday. Preston unfortunately didn’t have a strong timed practice missing the top ten and will be starting the opening heats from position thirteen. Heat 1 come around and Preston got a clean get away jumping up to position twelve of the start. Preston had stronger pace then his starting position showed and he was able to make a move on lap three into position eleven and lap five into the top ten making a fight back. The former national champion was able to make another move in the second half of the race into position nine and that is where he finished heat one making good progress from his starting position. After a strong turn around in heat 1 Preston didn’t quite get the start he was after in heat 2 dropping down to position fourteen of the start and now having work to do. Preston made his way back up into position thirteen with a move on lap three before going in chase of his next target. The former national champion was able to make his way up into position twelve in the back end of the race where he finished again moving forward from his starting spot. Preston was starting out of position eleven for heat 3 moving up two spots from his original starting position. Preston had a poor start due to the fact he had to avoid an accident between other karter’s dropping him back to outside the top fifteen in sixteenth spot. Preston had no luck in the race getting shuffled back further coming home in a disappointing position eighteen with work to do for the final two races of the weekend. Preston started out of position twelve for the fourth heat and got away to a clean start and maintained his position over the opening half of the race. Preston looking to make progress unfortunately struck more drama with a clutch failure ending his race and causing a DNF for the former national champion hurting his starting spot for the final and his points to the championship. Preston started out of fifteenth for the final and due to other people’s incidents got another poor start and dropped back to the rear of the field in last spot with all chances of a good result gone. Preston was able to make his way back into the top fifteen by the races end recovering from his poor start. Prestons Sunday went from bad to worse when a post-race drop down nose penalty dropped the former national champion down to position eighteen in a disappointing end to the weekend. Preston overall was disappointed with the weekend but was happy to stay in the top ten in the championship in ninth. “Very average weekend” noted Preston. “We had engine issues and kart setup issues all weekend and Sunday was one of those days. No qualifying hurt us as I believe we would have been well inside the top ten. Thankfully we’ve only dropped down to ninth in the championship and we will come back stronger in Monarto”. 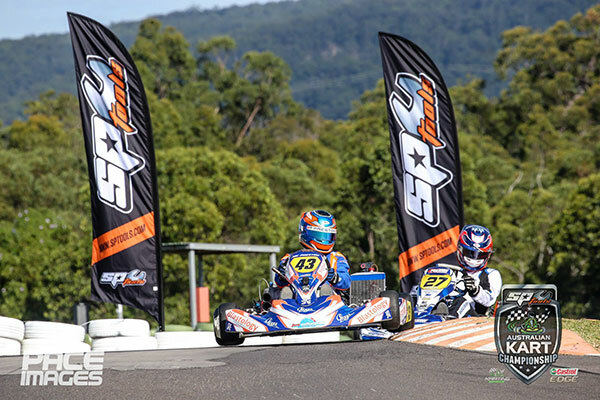 Preston will next be out on circuit for the third round of the Rotax Pro Tour in Ipswich QLD.